Fifteen and a Half Weeks in the Mountains: What Makes a House a Home? I’ve lived in a lot of housing units in my life. 31 now, to be exact, if you count living somewhere as a stay of at least one month. Even if you think the threshold should be three months, I’m still at 26. And all but two of those were after high school. So it’s no surprise I’ve never felt much of a connection to the places I’ve lived. They never were much more in my mind than just what I called them – housing units. Or domiciles, quarters, lodging, a roof, a pad. “Home” is not a status I’d confer on any of them. This number 31 on the top of a hill hasn’t reached “home” status yet either, but only emotionally speaking. Acquiring a new property is like dating. You see it once and it’s gorgeous and you become infatuated; you see it a few more times and realize it’s something you want to get to know better; and then your feelings grow from infatuation into something deeper, so you decide to make the relationship exclusive, but even then, a long time might pass before you really fall in love. Although I suppose the analogy kinds of breaks down at the end there because in the case of buying a house, you’re really getting married and moving in together before you fall in love. So I guess this was an impetuous wedding in a chapel in Vegas, although my partner would beg to differ given the months of extra special frustration associated with acquiring a mortgage and insurance for a property in an area prone to wildfires. But true love can’t be far behind the fascination we both still very much have with this house and property. Here’s why. Work: Pride in ownership. It’s an old but true concept. This house is a lot of work and the more work we put into it, the more it feels like ours. Stacking firewood, cleaning gutters and chimneys, plowing and shoveling snow, weeding the walkways, removing large rocks from the driveway and road, staining decks, fire mitigation. These are not things you have to do in most rental properties or condos. We did take the “easy” route and got a property that doesn’t require any lawn maintenance, but…who am I kidding? There’s nothing easy about this place. The work we put in isn’t just a matter of spending a little money and energy now to prevent major problems in the future. It’s also that this place is stunning. The previous owners put so much thought into the design and so much effort into the upkeep and we want the house to continue to make our jaws drop every time we pull up the driveway. True, I’ve already killed everything in the garden. I only had one chance in my life before to try to have a garden, so my green thumb is rather wilted at the moment. But I’m looking forward to the challenge next spring. 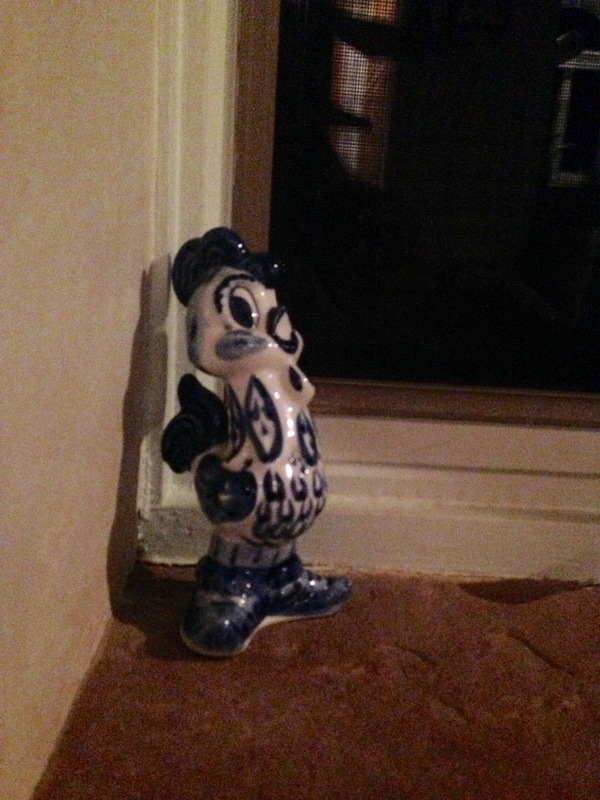 Personal effects: In the six years I spent living abroad, I collected a lot of art and memorabilia and tchotchkes. In the nine years since I’ve been back, I’ve given a lot of them away or simply left them behind as I moved from place to place. A few I hung on to, although I put them on display less and less. When I moved in with my partner, I put none of them on display. It’s not that I couldn’t have; he wouldn’t have objected. He had old family photos and newspaper articles that were incongruous with our industrial décor exhibited around the loft. But the artifacts of my previous life stayed in storage while we bought new artwork to fill the remaining wall space. Now those artifacts have been dusted off or put in frames and are out for guests to enjoy and inquire about. I think I did this partly because some items simply fit the style of our curved, sloping, bright adobe structure. But others were resurrected because I think somewhere inside, I know this is home and we, all of what makes us who we are, belong here. 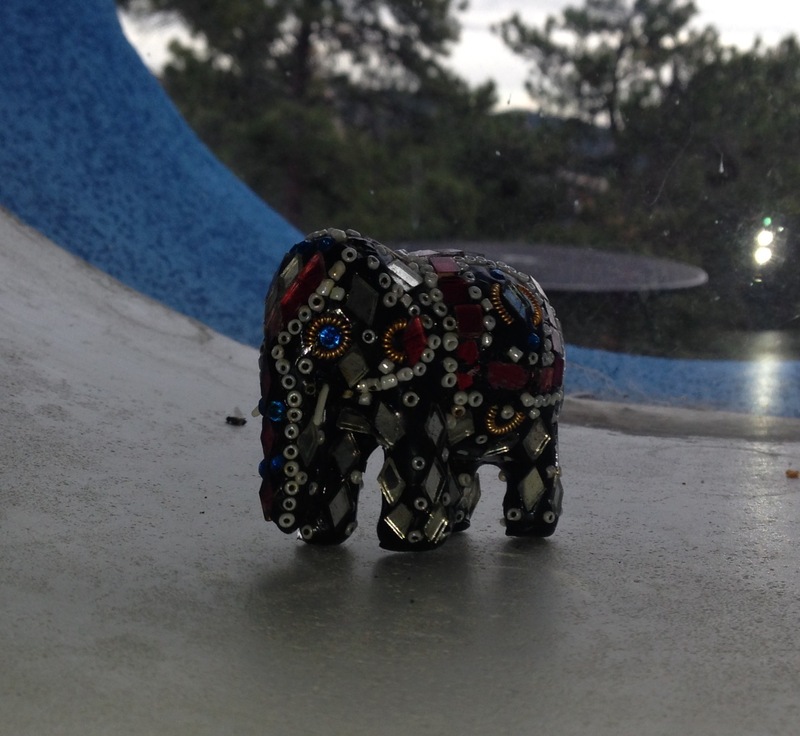 A jeweled elephant statue. It was the first item I bought in India, which was also the first really foreign place I lived (if you don’t count Australia). It cost about 10 cents. 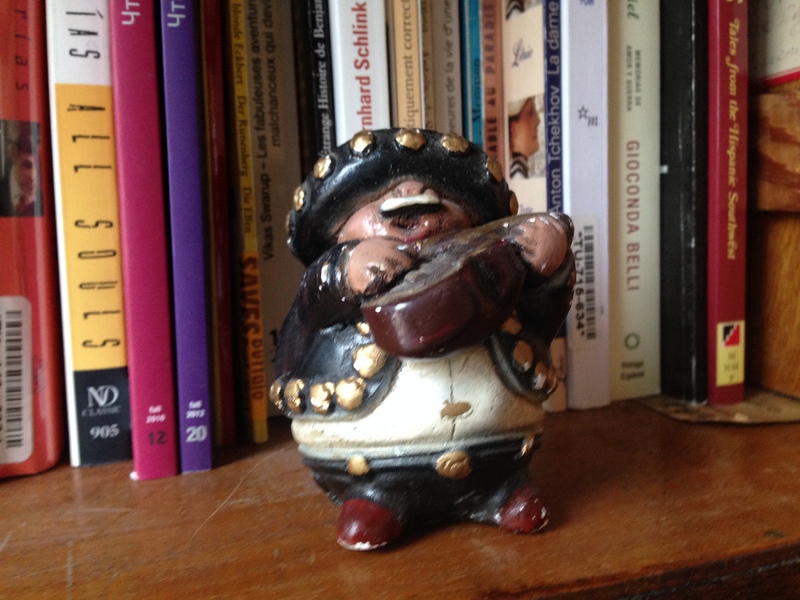 One of my three adorable mariachi men, although sadly only two survive. 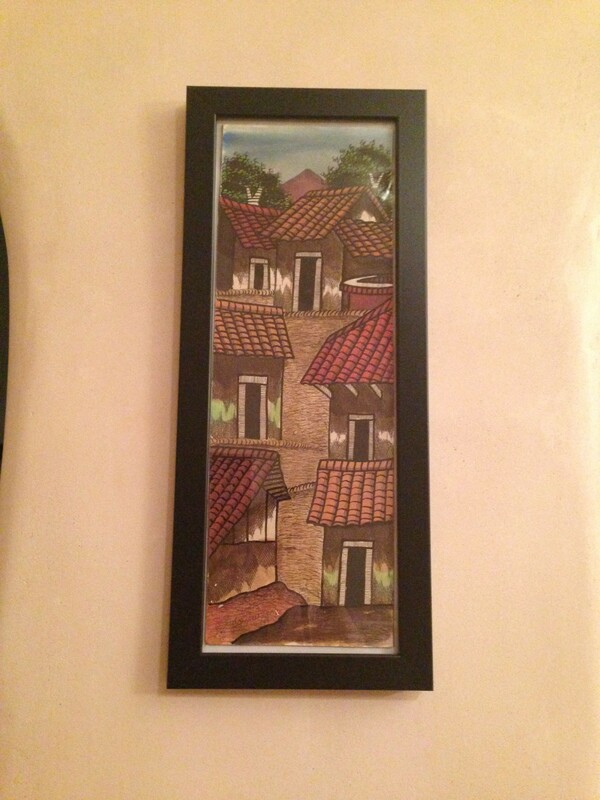 I can’t remember if I bought this in Mexico or Honduras but it goes perfectly with the style of our house. Gzhel (from Russia). I used to have so many gzhel statues but only this one remains because it’s the only one I bought for myself. More tchotchke from Russia. 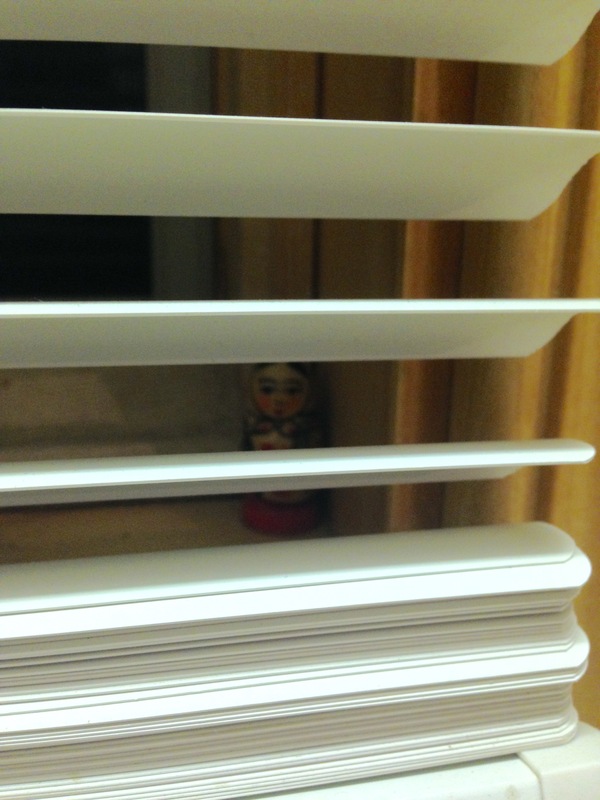 This little KGB agent spies on our guests. No one has noticed it yet, or if they have, they’ve been too intimidated to say anything. I’ve had this vanity table stool as long as I can remember. Definitely over 30 years now. 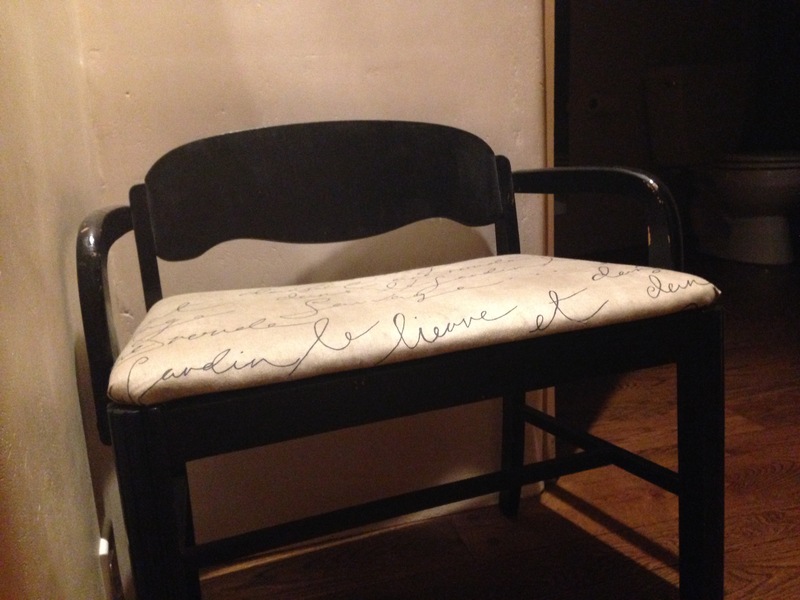 I’ve repainted and reupholstered it several times, but I have yet to pick out a style for it for this house. 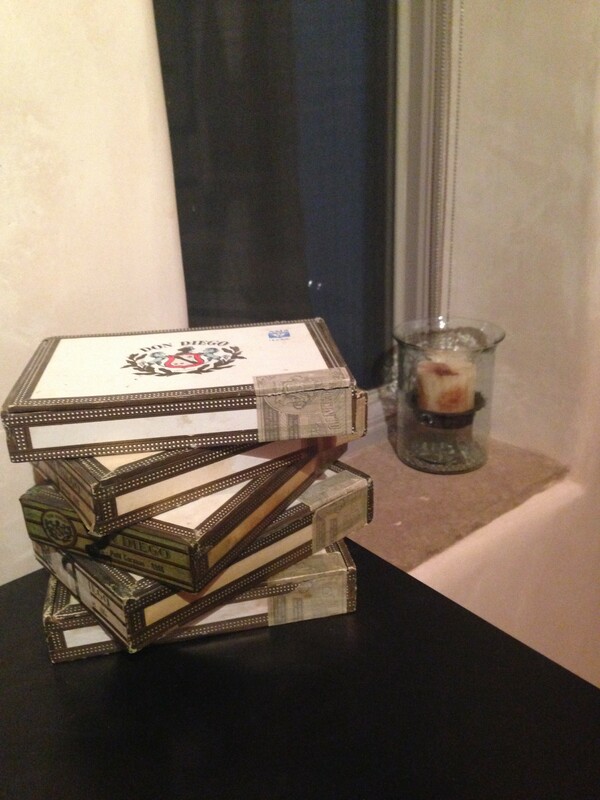 Cigar boxes from my grandpa, who passed away 25 years ago. Some of them are now stacked up by the fireplace and hold fire starters. And how fitting that just six weeks ago, I finally collected the last of my belongings from my parents’ house in Buffalo. I can’t recall why I had a few boxes of books and old diaries and CDs lingering in one of their closets. When I moved to Colorado over seven years ago, I drove a huge moving truck. I can’t believe those few boxes wouldn’t have fit, but for some mysterious reason, they stayed behind. And I only visited my parents twice in the last seven years before this last trip and didn’t have a free baggage allowance, so my stuff lingered on in New York. Somehow it all just seems fitting that I was able to collect the last parts of my former self only after I moved to this place. Neighbors: Neighbors are an important aspect of feeling like you belong somewhere. We had plenty of friends and acquaintances in Denver, but surprisingly few of those were in our buildings. Our first building had only 12 residential units, the same as the number of houses in our current neighborhood. Over time, we became chatty with some of the other people in that building and over quite a long time finally became good friends with a few. But our second building had 47 units and almost no one was friendly to us. While eventually a few people were superficially friendly to us, mostly just because my partner was on the HOA board, there’s no one we’re keeping in touch with. Compare to this neighborhood. Our nearest neighbor hosted a community barbecue three weeks after we moved in so that we could all get to know each other. When we pass each other on the trails walking our dogs, we always stop to chat. I’ve been to several neighbors’ houses for dinner or parties. I know the name of everyone on the street already. We have a community internet-based bulletin board where we share important information with each other, something my partner tried to implement in our last condo building but had zero interest in from the residents. I understand the main reasons for the difference. In a neighborhood like this one that is somewhat isolated and difficult to live in, there is more incentive to get to know your neighbors. There will be times when you need to rely on them. And in a city, people are just typically more closed off. It’s normal. But that doesn’t disprove what I’m saying. Knowing that my neighbors, even some who live in the next canyon over, know my name and are watching out for me, contributes greatly to a sense of belonging. Even when I drive home down the long canyon in the dark and see the illuminated houses of people I’ll probably never meet dotting the hillsides every 500 to 800 feet, I feel like I’m part of a deliberate and welcoming community in a way that the density of the brick and glass buildings downtown never provided. The reason I’m still stuck in the infatuation phase is that I just still can’t believe I live here. Maybe getting a house, instead of a condo, in the city would have had the same effect, but I doubt it. A house in the city, especially one with such a hot real estate market as Denver’s, can be sold in a heartbeat, which doesn’t alleviate the transient feeling of condo living. But no one acquires a property like this expecting to move out in a year or two, and no one would want to. This house and the neighborhood are one of kind. I don’t know how life took us to this place. This isn’t anything I could have imagined six years ago or even six months ago when we started looking. But The Sanctuary is undeniably magical. Very timely post with Chrisy and I in the final stages of planning our move. I’m not sure what analogy I would use for our current house. I guess the guy who settled for a girl who doesn’t really suit him but he didn’t think he can do any better, now realizes his mistake and wants a divorce. Ha ha ha! Well, you nailed it as far as our house-to-be. Chrisy is still in the infatuation stage. She’s only been there once and frequently pours over the pictures I took to glean every little bit of information she can. I’ve been back a couple of times for inspections and every time I leave I can’t wait to go back again. Hopefully, the neighborhood matches the small-town-USA feeling of the town we’re moving to. In our current house for over 7 years and barely know our neighbors well enough to even wave to if they drive by while we’re out working in our yard. I’m excited for you – can’t wait to come see the new place!